The northeast coast of Taiwan is home to verdant scenery, quaint villages and fascinating geography, and is a popular swimming and day trip spot for locals. 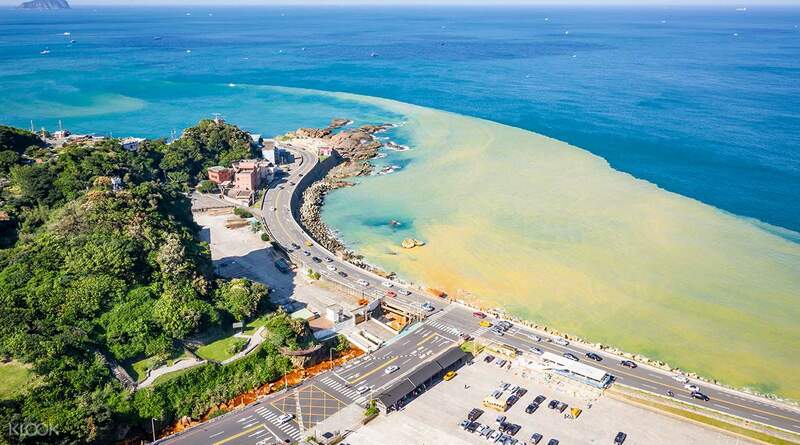 After a pick up from your hotel, you'll travel by air-conditioned coach to the scenic Bay of Two Colors, where you'll get to take in the stunning combination of blue and yellow in the waters of the ocean. 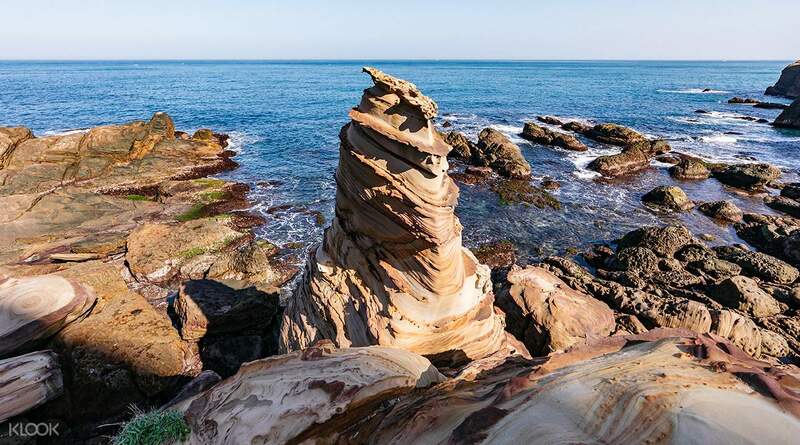 You'll then make your way to Nanya, the area's unique erosion and weathering has created a veritable sculpture garden, with rocks that sport a beautiful striped pattern caused by an oxidation reaction. 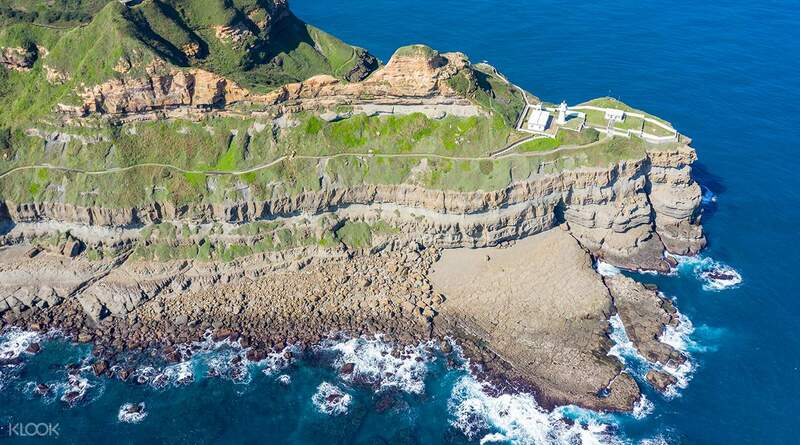 Stop by Pitou Cape, lined with caves and sheer overhanging cliff faces, and offering fantastic views. 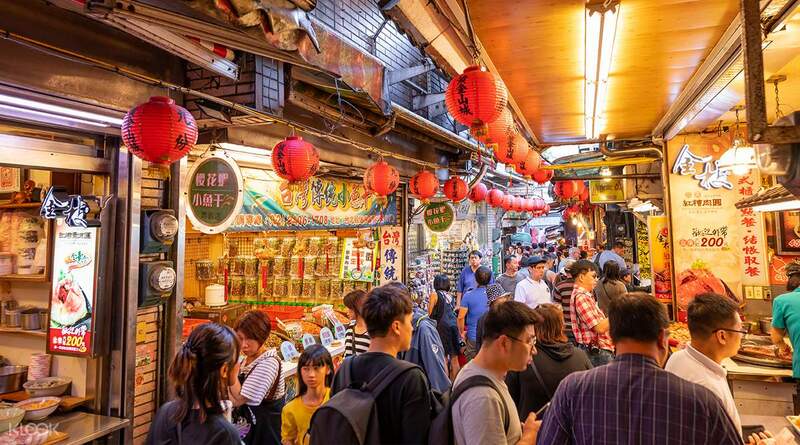 Pass by Jinguashi Village as you make your way to Jiufen, an 1890s gold mining boomtown that has since faded into a quaint village you see today, but is well worth visiting for the street snacks, flourishing teahouses and a fascinating glimpse into life during its golden era. Very nice tour if you love sceneries, it is breathtaking. Our tour guide Jenny gives us inputs about what we are passing by, also she's very approachable. 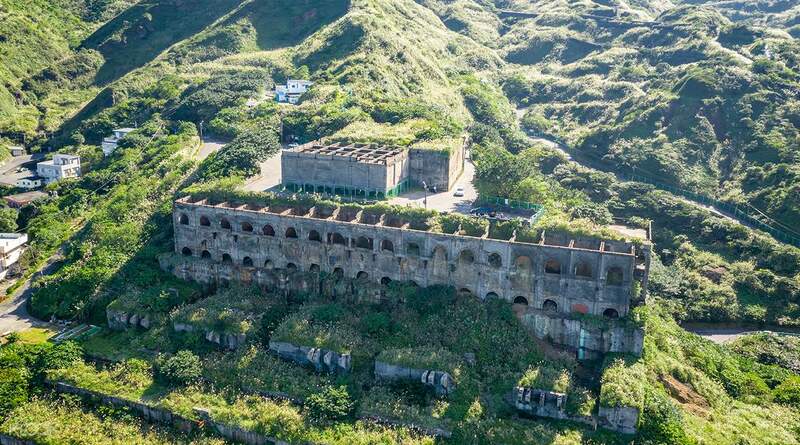 Our first stop is the Nanya rock formations, followed by the Yin Yang sea and the abandoned ore refinery – Thirteen Level Smelter or also known as Remains of Thirteen Level which causes the two color in the sea. our third stop is the golden waterfall, then we have gone to Jiufen where Jenny gives us our own time to experience and explore Jiufen. Overall, it is worth 5 stars for the itinerary and our tour guide. Very nice tour if you love sceneries, it is breathtaking. Our tour guide Jenny gives us inputs about what we are passing by, also she's very approachable. Our first stop is the Nanya rock formations, followed by the Yin Yang sea and the abandoned ore refinery – Thirteen Level Smelter or also known as Remains of Thirteen Level which causes the two color in the sea. our third stop is the golden waterfall, then we have gone to Jiufen where Jenny gives us our own time to experience and explore Jiufen. Overall, it is worth 5 stars for the itinerary and our tour guide. It was a great experience though we went their with an expected rain. It was foggy and cold but still we did enjoy the trip. We also had a chance to meet new people who were in the tour as well. I love the people in Taiwan. They always smile and approachable. It was a great experience though we went their with an expected rain. It was foggy and cold but still we did enjoy the trip. We also had a chance to meet new people who were in the tour as well. I love the people in Taiwan. They always smile and approachable. Denny the tour guide was very smart. He knows a lot about each of the countries the participants came from and he relates it to Taiwan. He also knows a lot of languages and very fluent in English. The tour was not rushed and we had just enough time to roam around. It is nice to get out of the city and see the coastal side and Jiufen is stunning. Denny the tour guide was very smart. He knows a lot about each of the countries the participants came from and he relates it to Taiwan. He also knows a lot of languages and very fluent in English. The tour was not rushed and we had just enough time to roam around. It is nice to get out of the city and see the coastal side and Jiufen is stunning. we had a great time in Jiufen village. it is a must-see place to see the heritage of Taiwan especially during the time of Japanese occupancy. Jiufen village used to be a mining area. On the way to Jiufen, you will see the marvelous rock formations and the part of the ocean with two different colors. aside from this, the jiufen waterfalls will also capture your heart. Jenny, our tour guide did a fantastic job! we had a great time in Jiufen village. it is a must-see place to see the heritage of Taiwan especially during the time of Japanese occupancy. Jiufen village used to be a mining area. On the way to Jiufen, you will see the marvelous rock formations and the part of the ocean with two different colors. aside from this, the jiufen waterfalls will also capture your heart. Jenny, our tour guide did a fantastic job! This tour is highly recommended if you have a limited time in Taipei and traveling solo. Thanks to our tour guide, Jenny who is very fun, professional and passionate on her job. I really had a great time with this tour and I will definitely book again with Klook for my next travels. This tour is highly recommended if you have a limited time in Taipei and traveling solo. Thanks to our tour guide, Jenny who is very fun, professional and passionate on her job. I really had a great time with this tour and I will definitely book again with Klook for my next travels. The tour bus pick you up at your hotel which is save you tons of times,even though it just a 4 hours tour, it gives you plenty of time to explored the beautiful coast line. If times permitted, the tour guy can take you to see the water fall which is not on the schedule. I wish they can give extra half an hour to stay at 九份，one hour for me is not enough to experience all the stuffs they can offers. The tour bus pick you up at your hotel which is save you tons of times,even though it just a 4 hours tour, it gives you plenty of time to explored the beautiful coast line. If times permitted, the tour guy can take you to see the water fall which is not on the schedule. I wish they can give extra half an hour to stay at 九份，one hour for me is not enough to experience all the stuffs they can offers. Going up north was probably one of the highlights of our trip. The Nanya rock formation was one of a kind and Jiufen Village takes you to another world. The clim up was not for the weak-hearted, however, as it takes more than 100 steps to get to the shops (we could not get to the topmost part, we need to work out more! Haha!). Our guide was also very polite and friendly. We couldn't have asked for more! Going up north was probably one of the highlights of our trip. The Nanya rock formation was one of a kind and Jiufen Village takes you to another world. The clim up was not for the weak-hearted, however, as it takes more than 100 steps to get to the shops (we could not get to the topmost part, we need to work out more! Haha!). Our guide was also very polite and friendly. We couldn't have asked for more! Q: Can I choose a different afternoon pick up time? 1:00pm-2:00pm is not convenient for me. A: Sorry, this activity is considered a join in group tour and the only pick up time available in the afternoon is from 1:00pm-2:00pm.